With the construction industry’s trend toward bigger, faster, and cheaper commodities, it’s easy to believe the art of craftsmanship is lost forever. However, a glimmer of hope rests in the family-owned contractor Metalmaster Roofmaster, which is driven with the same pride and passion that sparked its inception in a small basement in 1977. Besides having pride in the work being done, the McHenry, Illinois-based company also runs on an infectious passion that lights up its employees, vendors, and customers. 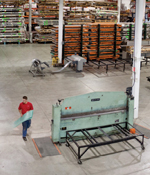 After operating from many different locations over the years, the company designed and oversaw the construction of its state-of-the-art 100,000-square-foot headquarters and custom-fabrication facility, which opened in 2004. Sitting on a scenic eight acres, the facility is the epicenter of the company’s day-to-day operations, which include estimating, drafting and engineering, CAD, project management, accounting, legal, dispatch, inventory, fabrication, and welding, as well as a full-time auto center to service its fleet of delivery trucks and equipment. The trend here is that Metalmaster Roofmaster is not just another company poised to be doing the work it loves. The company truly believes in and yearns for the accomplishment of a job well done, which is evident in its most recent acclamation of the prestigious President’s Club Award, Master Contractor Award, and Inner Circle of Quality Award from Firestone. These awards honor the company’s beliefs and values, which are at the core of everything it does. For a company that is set in traditional values of “Do it right the first time” and “Our word is our bond,” it is anything but behind the times. In an economy where everyone else is cutting back, Metalmaster Roofmaster is investing even more into cutting-edge technology and employee development. Whether it’s working on projects to achieve LEED certification or aligning with the top green manufacturers, it continues to incorporate the latest trends and quality products into its roofing systems, in order to best serve its clients. Whether it’s a large department store or a building adorning the skyline of downtown Chicago, Metalmaster Roofmaster’s reputation for quality is embedded in some of the most ornate projects throughout Illinois, along with parts of Indiana and Wisconsin, and in the minds of anyone who has ever worked with the company. This entry was written by connor, posted on June 22, 2010 at 7:00 pm, filed under Case Studies, General. Bookmark the permalink. Follow any comments here with the RSS feed for this post. Comments are closed, but you can leave a trackback: Trackback URL.